The Optima is one of Aurora’s higher-end pens with a piston fill system and a 14k gold nib. 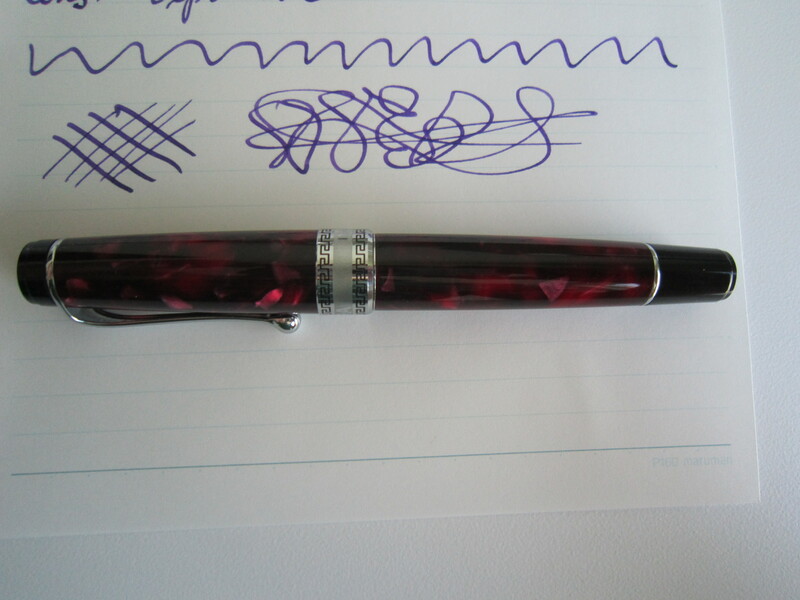 My Optima has a factory oblique-double-broad (OBB) nib and a burgundy “Auroloide” (celluloid) body. The nib can be unscrewed for easy swapping. Being a piston filler this pen holds a lot of ink and even has a “reserve tank”. 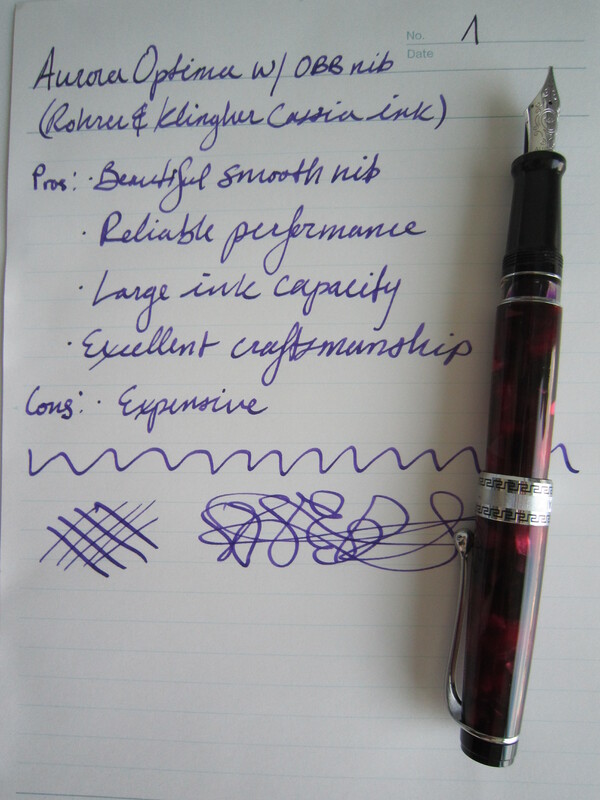 When the pen becomes low you simply twist the piston knob as far as it will go and this activates the special reserve tank which gives you another page or so of ink. 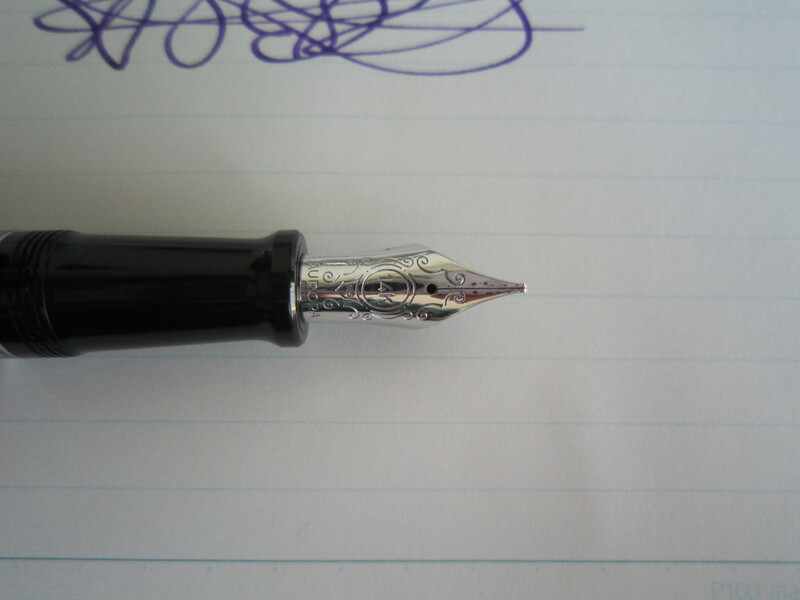 The Optima has the smoothest piston of all the pens in my collection, it is a real joy to use. Aurora makes all of its nibs in house and the Optima’s nib is large and beautifully decorated. This is my only OBB nib and I was surprised by how much I like it. 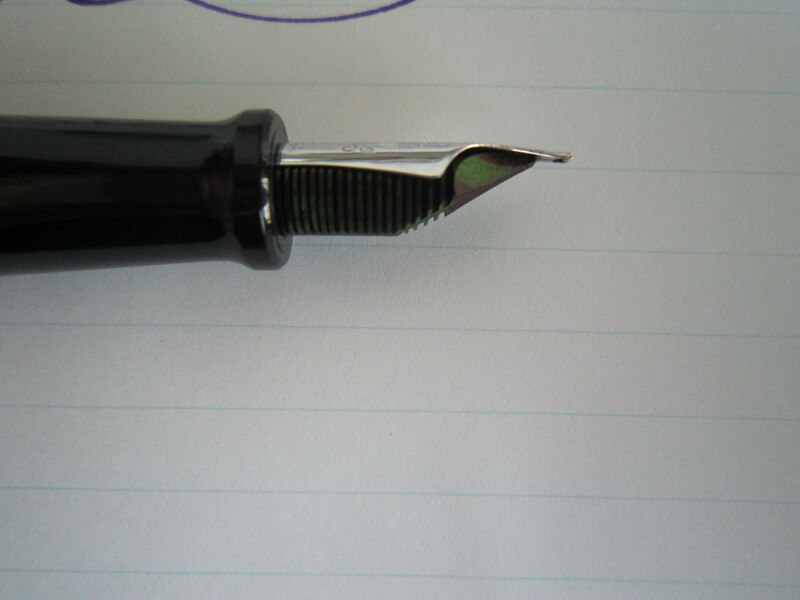 The nib glides effortlessly across the paper without being overly toothy like my other stub and oblique pens tend to be. Aurora is famous for having nail-like nibs and the Optima’s is no exception. If you are looking for some flex this definitely isn’t for you. The nib features and ebonite feed with lots of fins. This pen has been very reliable; it doesn’t skip and starts right away even after being uncapped for 15+ minutes. The Cassia ink appears green on the ebonite feed. The Optima has a very nice weight and size. It’s a shorter pen at 5.9 inches capped but is thicker than normal at slightly over half an inch at the widest point making it very comfortable to hold. The Optima’s dimensions suit me very well. The celluloid body is beautiful. The flat cap and engraving on the barrel which reads “AURORA ITALIA” and “FABBRICA ITALIANA DI PENNE A SERBATOIO” gives this pen a nice vintage feel. The embellishments on the cap are nice quality but I am not in love with them. 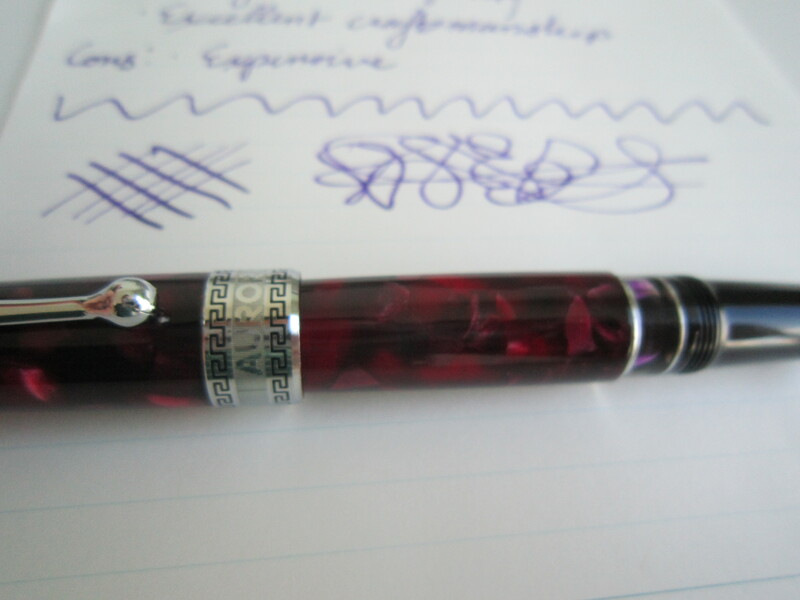 The Greek keys to my eye are not as tasteful as those found pens by OMAS and Montegrappa. I have had this pen for about six months and it has been in my regular rotation since purchase. It’s a great workhorse. The quality and attention to detail set this pen apart. Previous Post Welcome to The Unroyal Warrant!